Our Golden Dream Carry Forward To Rio 2016 – footsteps……..
To date Malaysia had won five Olympic Medals and all came from Badminton.Our first Olympic medal was from the Sidek brothers of Razif and Jailani in 1992 Barcelona Olympics and it was a Bronze. Then in the next Olympic at Atlanta in 1996, Malaysia achieved a Silver and a Bronze. Ever since our best achievement is just a Silver. That’s why London 2012 is our first Gold target. Malaysia is hoping the Gold comes from Dato’ Lee Chong Wei because he is World number one badminton player but Lin Dan played a better game to dash our hope. Dato’ Lee Chong Wei lost to his arch rival Lin Dan from China at Wembly Arena in London in a hard fought match. He wins the first game 21-15 but went down in the second game 10-21 and finally in the rubber 19-21. He gave out all his best to fulfill the hopes of 28 million Malaysians. Then post on Facebook was this uncalled for comments from a Malaysian who tries to make a mockery of the outcome on his tweeter that angered sports fan. He should not have made the comments in the first place at the time when all Malaysians feels sad with the lost. Every Malaysian was looking forward for Dato’ Lee Chong Wei to bring back our first Olympic Gold. he did his best but lost to a better player. That is sports and a sportsman accept defeat with decorum and not send out sarcastic messages to the players. Then again our media practice is not much of help to heal the wound with this Kosmo frontpage. Kosmo think that Dato’ Lee played for the RM 4 million perks and personally I think this is an insult to Dato’ Lee. Even though the Editor put in a mild way but when he bring up the issue of monetary gain, it gives a negative perception to the public. 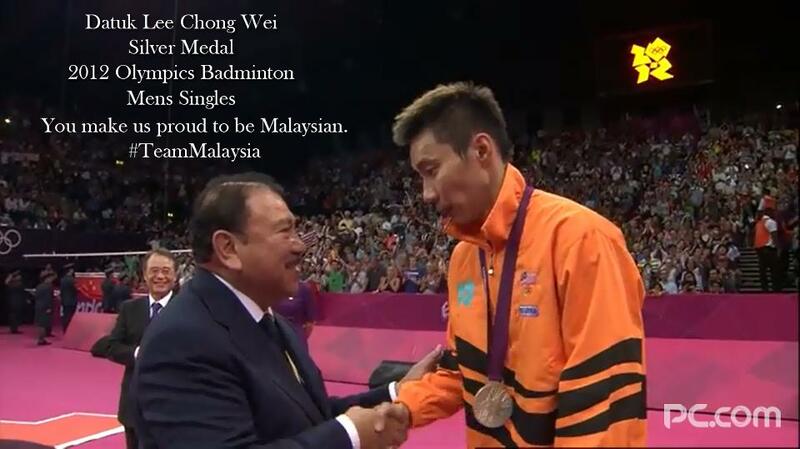 If Dato’ Lee did win the Gold medal, the public might think that he won because of the money and not for the pride. When will our media change and be a sportsmanship enhancer? New Straits Times put it in a consoling way with full respect to Dato’ LCW while Berita Harian published his apology to the people of Malaysia. However most sports fans in Malaysia specifically and the world over generally (based on Facebook comments) wanted Dato’ Lee to reserve his apology because they had seen how he fought all the way to the last point. Sports fans are satisfied with his performance even though Malaysia loose the expected Gold medal. 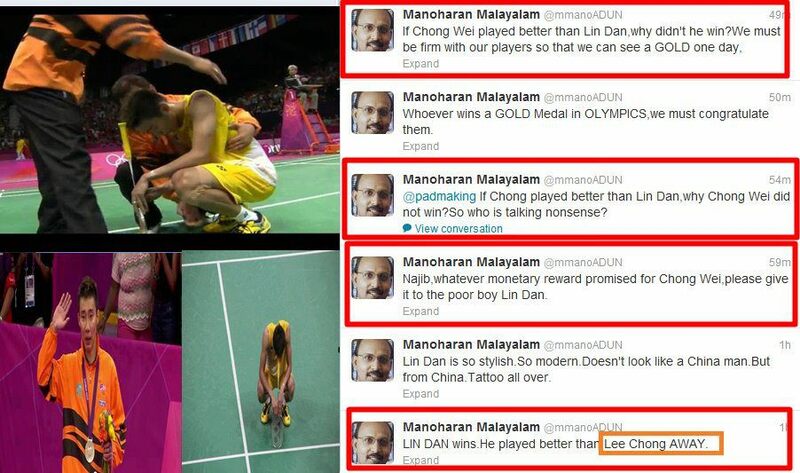 Even badminton fans from China respected Dato’ Lee’s sporting spirit when we ourself making negative comments. 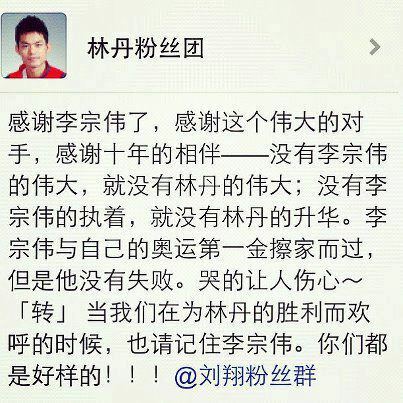 (Translation)Thank you very much, Lee Chong Wei, Thank you for being such a noble and worthy opponent, and thank you for 10 years of company – without Lee Chong Wei’s worthiness, there will not be any Lin Dan’s worthiness; without Lee Chong Wei’s persistence and perseverance, there will not be any progression for Lin Dan. 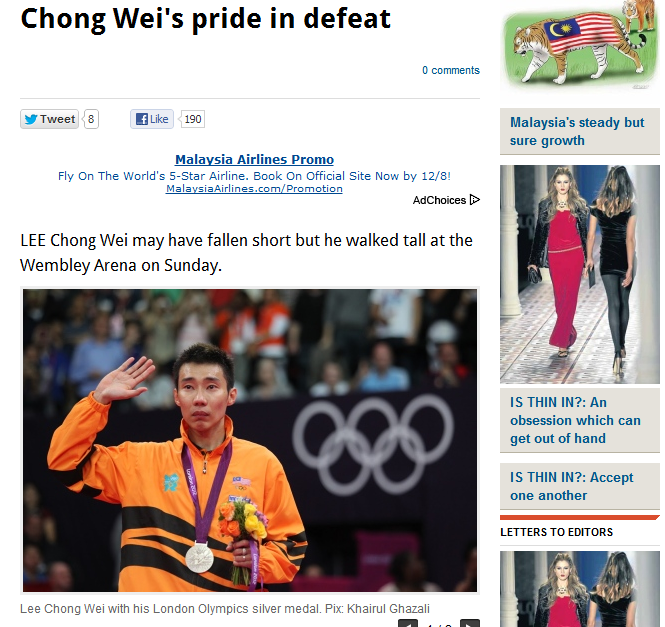 Lee Chong Wei missed his first Gold Medal, but he didn’t fail. We felt for his cries. Finally the pic that show Dato’ Lee.